Auger electron spectroscopy (AES)—also known as scanning Auger microscopy—is an effective surface analysis technique that can help manufacturers across an array of industries understand more about the surfaces and interfaces of their products and troubleshoot quality control issues. By using an electron beam to excite the molecules on the surface of a sample, Auger analysis can help analyze passivation layer composition, as well as identify small particles, contaminants, and stains on conductive or semi-conductive materials. Dive into the tabs below to learn more about what Auger microscopy is, its applications and when it may be a good fit for your needs, examples of the technique in action, and Innovatech Labs’ Auger testing and analysis process, testing capabilities, and sample requirements. Since 1990, Innovatech Labs has provided clients in the medical device, electronics, and general manufacturing industries with accurate and cost-effective Auger lab services. Our team of analytical scientists boast more than 100 years of combined experience in the analytical sciences field. 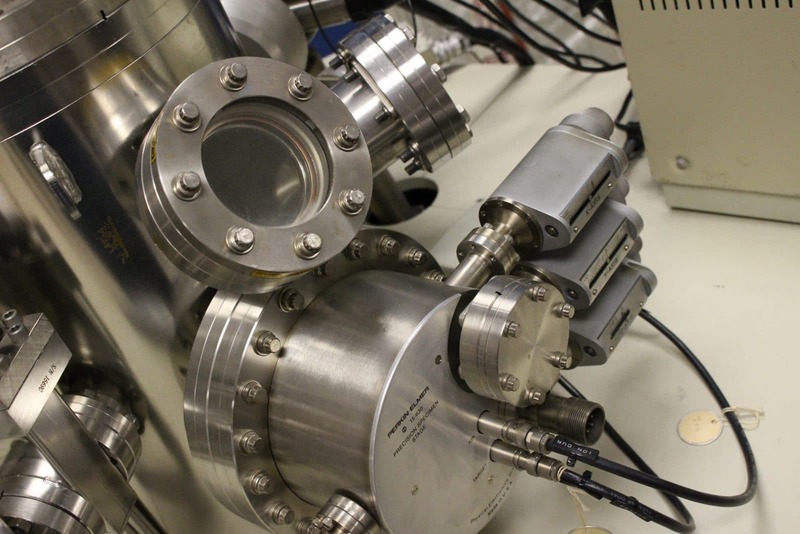 What is Auger Electron Spectroscopy? 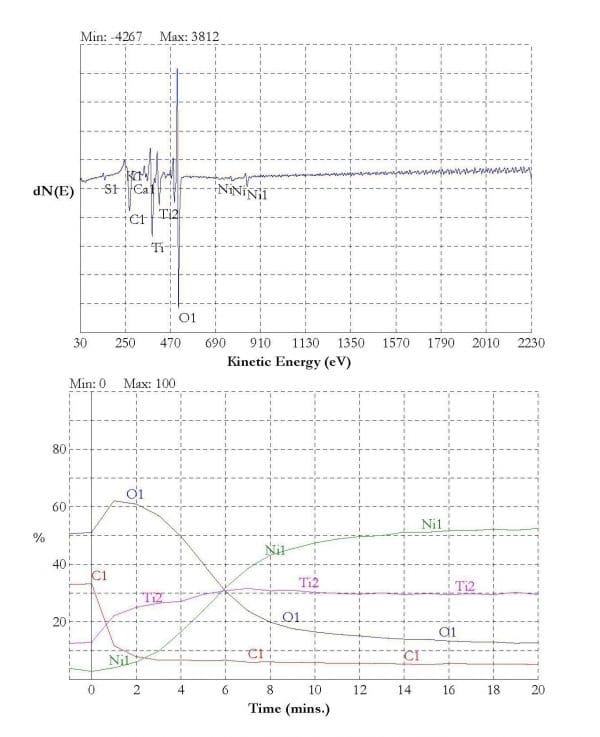 AES analysis is a surface analysis technique that excites atoms on the surface of a solid sample to release photoelectrons to provide information about the composition of the surface of a material. Identify elements or contaminants present on a surface. Determine atomic concentrations of elements present on a surface. Map the lateral distribution of elements. Measure the distribution of elements as a function of depth. The survey scan, which identifies the elemental composition of the analyzed surface. The multiplex scan, which measures the atomic concentration of the elements identified in the survey scans. Detection limits are approximately 0.1 atom percent for most elements. The mapping process, which measures the lateral distribution of elements on the surface, with spatial resolution being approximately 0.3 microns. The depth profile, which measures the distribution of elements as a function of depth into the sample. Depth resolution is dependent upon sample and sputtering parameters (less than 100 Å resolution is not unusual). Typical sputtering rate is ca. 30 Å/min. Following the test, our scientists analyze the results to provide you with insights and actionable recommendations to guide your product development process or mitigate product quality issues. The applications of the Auger technique are wide-ranging. But most often, manufacturers engage our services to analyze and identify contaminants or stains on a material’s surface or determine the composition of a surface while also mapping surface constitutes. 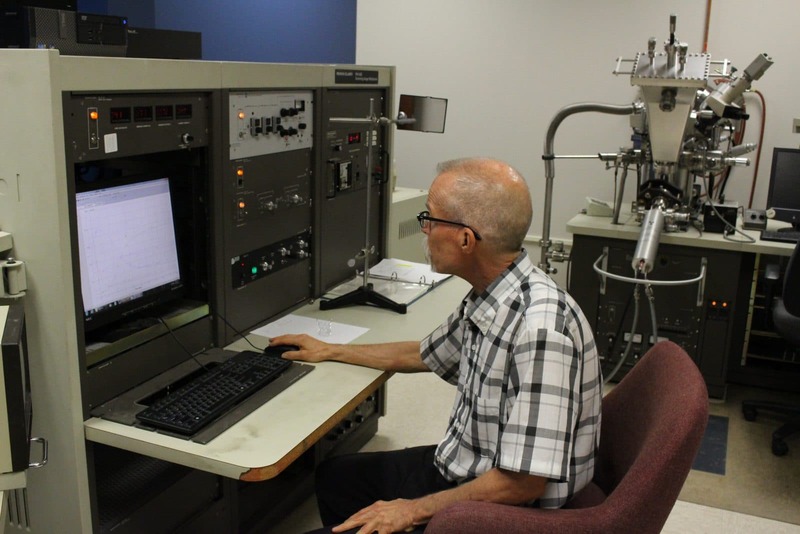 Is Auger electron spectroscopy a good fit for your needs? Contact Innovatech Labs today. Ensuring the integrity of medical device passivation layers is of critical importance. Because passivation layers are innately part of a device’s surface make-up, Auger is often an accurate, go-to materials testing technique to determine if passivation does or does not meet requirements. Product quality, function, and safety are paramount to all manufacturers—particularly high-tech manufacturers such as those in the medical device or electronics industries. Contamination or composition shortcomings can disrupt all three, but Auger can perform the needed analysis to identify contamination sources and help guide your next steps to mitigate problems. 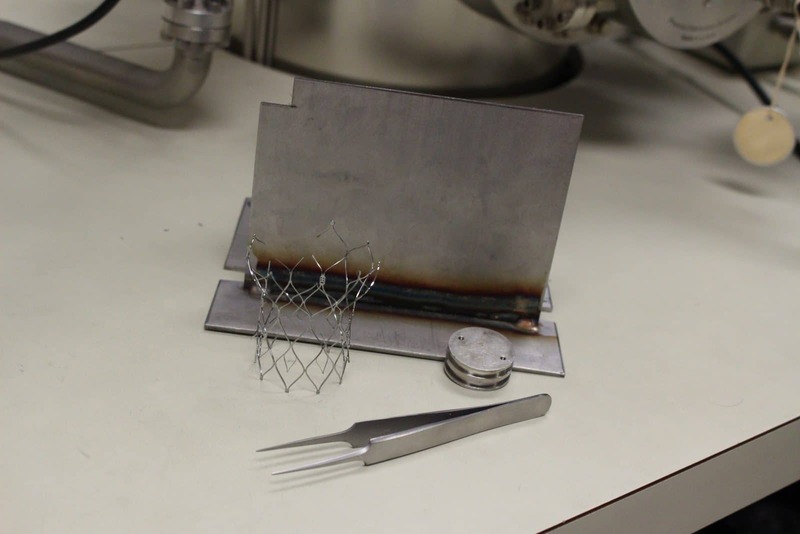 Example 1: As procedures become less invasive, Nitinol stents are becoming an increasingly important materials for medical device manufacturers and ensuring the proper passivation is key. Auger analysis can uncover surface impurities or improper passivation layer depth of Nitinol stents. Example 2: Electronics manufacturers understand that cleanliness is key to product function. When a head crash occurs, it can be hard to pinpoint the cause. However, AES can help identify contaminants and help you map the issue back to a step in the production process. Review all our analytical testing case studies to learn more about our capabilities. Sample size: Samples of AES have a maximum size of ¾”x½” (18 mm x 12 mm), and height should not exceed ½” (12 mm). The minimum area of analysis is 0.3 microns. Sample type: The sample must be conductive, or area of interest must be grounded properly. Insulating samples including thick insulating films (ca. 3000 Å) cannot be analyzed. Sample compatibility: The sample must be compatible with high vacuum environment (ca. 1×10-9 Torr). Timing: The typical analysis time is about ½ hour per sample. However, depth profiles may take longer depending on the total depth being sputtered. Innovatech Labs provides prompt service on all AES analysis samples. In fact, most samples can be analyzed in in five business days or less. In addition, we also offer expedited analysis, which can get your results in just 24-48 hours. Contact us today for more information about AES analysis or request a quote.